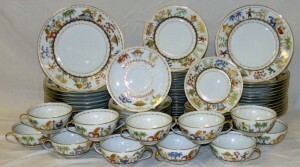 A gorgeous 81-piece Tiffany & Company china set in the Cirque Chinois pattern, in excellent condition, sold for $16,675 at an auction held June 15 by Philip Weiss Auctions in Lynbrook, N.Y. Also, original cover art for the the comic book Battle Classics #3 (DC Comics, Jan./Feb. 1979) by the legendary illustrator Joe Kubert (Am., 1926-2012), fetched $8,360; and an oil on board sci-fi painting by the equally renowned Chesley Bonestell (Am., 1888-1986) , titled Rhea, Saturn & Spacecraft, rose to $7,475. Prices are inclusive of the buyer's premium. 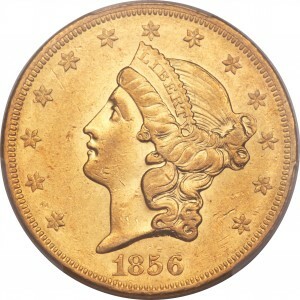 An 1856-O Secure Liberty Double Eagle $20 gold coin, graded AU 55, the rarest issue in the 71-year history of the New Orleans mint, sold for $364,250 at a Long Beach Expo US Coins Signature Auction held June 10 & 12 in Long Beach, Calif., by Heritage Auctions, based in Dallas, Tex. Also, an 1895-O Morgan dollar, graded MS65, fetched $258,500; a 1921-S Liberty Walking half-dollar US coin, graded MS66, made $188,000; and an 1804 Stars Reverse Quarter Eagle coin, graded AU50, gaveled for $146,875. Prices include a 17.5 percent buyer's premium. A large B.A. 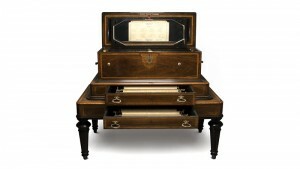 Bremond Swiss cylinder music box dating to circa 1885 sold for $19,200 at a Decorative Art Auction held June 18 by John Moran Antique & Fine Art Auctioneers in Monrovia, Calif. Also, a large-scale composition by Sri Lankan painter Senaka Senanayake (b. 1951), titled Paddy Growers, earned $8,400; an untitled oil by Frederick William Leist (British/Australian, 1875-1945) realized $7,800; and a thrown and glazed pottery vase by Los Angeles artists Gertrud and Otto Natzler made $6,000. Prices include a 20 percent buyer's premium. 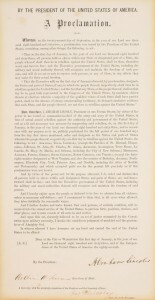 A limited-edition copy of the Emancipation Proclamation, the only version with the full text to be signed by then-President Abraham Lincoln, sold for $2.17 million at a Rare Books & Manuscripts Auction held May 26 by Sotheby's in New York City. It is one of only 27 Emancipation Proclamations in existence (19 are in institutions). Also, a rare manuscript copy of the Thirteenth Amendment to the US Constitution, also signed by Lincoln and one of only three 'Senate' copies known to exist, realized $2.41 million. Prices include the buyer's premium. 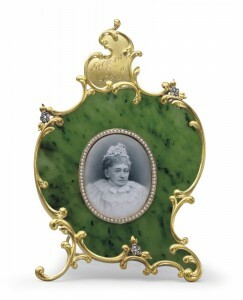 A jeweled gold-mounted nephrite (greenstone) photograph frame, marked Fabergé (Moscow, circa 1898), sold for $245,000 at Part One of The Private Collection of Joan Rivers, held online from June 18-23 by Christie's in New York City. Also, a silver dog bowl for Ms. Rivers' dog Spike, with the mark of Tiffany & Co. (N.Y.), made $13,750; a pair of 20th century Louis XVI-style cream-painted canapés rose to $37,500; and a 20th century toilette set retailed by Penhaligon's of London finished at $4,000. Prices include a 20 percent buyer's premium.